• What amount of life insurance should I choose? • How much insurance protection do I need if I have children? • What are the best life insurance companies? • What kind of life insurance policy do I need? Question 1: How Much Life Insurance Should I Choose? So, how much life insurance coverage do Canadians choose? This data originates from our InsurEye Price Comparison tool, free for all Canadians to compare their own insurance costs with those of other people in similar peer groups. 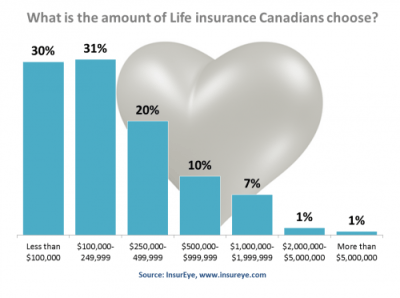 Our data shows that most Canadians choose life insurance under $500k. We recommend speaking with a knowledgeable insurance broker or insurance representative before making this big decision. There might be other potential financial responsibilities that you have not calculated. If you have children, the costs can be much higher than you think – just take a look at the next section. A separate word on Mortgage Life Insurance Protection: In most cases having separate mortgage insurance is not recommended. Having enough life and disability insurance can encompass a mortgage, avoiding policies overlaps. If you are looking for insurance to cover your funeral expenses only, the coverage you need, would be lower – approximately $10-30k. A funeral insurance quote will help you to understand the exact costs for this type of insurance. Question 2: I Have Children – How Much Life Insurance Do I Need? Overall costs add up to $243,660 as the total cost of raising a child to the age 18. This means $1,070 per month over the course of 19 years. You should consider that this number does not include any post-secondary education costs. Having several children will obviously increase this amount correspondingly. Have you calculated these numbers into your life insurance protection? Question 3: What Are the Best Life Insurance Companies? This analysis is based on the data from our own independent insurance review platform. We do not promote any insurance companies, but collect and analyze what other Canadians share about their insurance providers helping to understand what are the best Life Insurance companies in Canada. All companies are evaluated based on reviews across two dimensions: Customer Service and Value for Money. We strongly encourage consumers to check the most recent version of our Independent Consumer Reviews, find out which companies appear to be best for them and share their own experiences! Remember, if auto or home insurance protect your assets, life insurance protects your family! Question 4: What Type of Life Insurance Do I Need? Term Life: Life protection that will expire at the end of a set term (e.g. after 5, 10, 20 years) and which does not accumulate any value. A Term Life Insurance policy is a pure insurance product: simple and easy to understand. Universal Life: It is a combination of life insurance and an investment component. A portion of your premiums go into your account, increasing your net worth. You can choose how the investment component is invested. A Universal Life Insurance Policy typically comes at a higher cost than a Term Policy. Whole Life: One of the most complex life insurance products. Like Universal Life, a Whole Life Insurance policy also has both insurance and investment components. However, they typically offer less flexibility (e.g. the insurer decides how the investment component is invested). This product is also more expensive than Term Life insurance. While each type of life insurance has its pros and its cons, we believe, the best choice for most people is very often Term Life insurance. It’s the simplest product to understand, it’s the cheapest protection you will get, and it fully fulfills its purpose – to protect. One of the fans of simple Term life insurance is Suze Orman, one of the leading personal finance gurus in the U.S.A. This video about Suze’s perspective on life insurance is fully applicable to Canada. 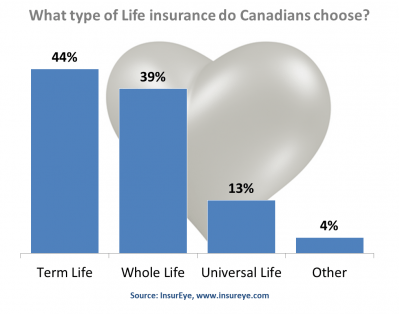 According to InsurEye analysis, Term Life is the most popular life insurance protection type in Canada. Nearly 45% of InsurEye users, who have Life insurance, report that they have purchased Term Life insurance. Please speak with a qualified insurance broker or advisor before making any important decisions associated with such an important topic. An insurance broker can also help with other types of insurance policies such as dental insurance policy, disability insurance coverage, or burial insurance protection (also called funeral insurance plans). Please note, that this article is provided for educational purposes only. it is very clear that term insurance is the most appropriated for everybody. Primerica is ranked highest because more people favour it. I am sorry for the experience you had, I don’t know what happened exactly, or why, but it sounds non-typical for sure. Primerica pays out $1 billion in insurance claims every year and was the first to pay out after 9/11. Primerica has helped thousands of people save on life insurance by replacing expensive low-coverage policies with much higher coverages. And it helps them invest the funds they save. You cannot beat this combination. More people favorite Primerica term??? Then why do they only have a 1.8% share of the term insurance market? I’m sorry to hear that Jessica, but my sister just recently passed away with Pancreatic cancer and Primerica did pay out the claim. You are severely mis-informed about life insurance in Canada Jessica! Primerica and all life insurance companies in Canada (when purchasing your own personal policy in Canada) do not practice post claim underwriting. Mortgage insurance offered by the banks practice the process of post-claim underwriting. Please get your facts straight before posting nonsense on an excellent website. Jessica, you lie. Probably an agent with a competing company. Send me your fathers name and I will verify the lie. Primerica operates the same as all of the other companies. I would do a bit more research before believing that about the Primerica life products. If you do a search on which company paid out first (almost immediately after a death claim was made) for the victims of 911, you will find that Primerica stood behind the policies while many other companies were denying coverage because the deaths were due to an act of terrorism. Primerica does their underwriting BEFORE any policy is issued, not after. In my experience, the ones doing post qualification on insurance products are BANKS. a financial need analysis is required to find out the need of insurance with whole life and with universal life its too expensive to do this that’s why but term and invest the difference is the way to go. Spoken like a true WFGer, Buzz Smith probably got this idea tattooed in his brain before he even got a license (doubtful he ever did). Why would the worlds wealthiest families even need life insurance ? You buy life insurance to protect your loved ones in the event of an early death. When you are wealthy and especially the wealthiest in the world why on earth would you be paying out for life insurance. Also insurance is to cover death you can’t live and die at the same time. That’s why you invest for living and insure in the event of death happening before you become financially independent. To build wealth in a tax-free manner. Primerica’s term insurance is 30+% higher priced, leaving even less to invest (in a high fee investment portfolio). I seriously think that this website is somewhat related to Primerica. I have been to Primerica, WFG, then finally an independent broker for most insurance companies in Canada. There are a lot of reasons why I would not offer Primerica and Transamerica Prosperity UL to my clients. Our partnering brokerage does not work with Primerica or endorses them in any form. Any discussions in the article comments reflect individual perspectives of site visitors.